Samoa edge USA and Japan retain the upper hand over Canada as the World Rugby Pacific Nations Cup 2015 continues in San Jose. Samoa survived a stirring second-half fight-back by the USA to beat the Eagles 21-16 in San Jose and get their World Rugby Pacific Nations Cup campaign off to a winning start. The Pacific Islanders scored all of their points in the first half, tries from captain and winger Alesana Tuilagi and full-back Ahsee Tuala and 11 points from the boot of fly-half Patrick Fa'apale helping them into a 21-3 interval lead. Eagles debutant Alan MacGinty kicked USA back into the contest before converting Titi Lamositele’s 74th minute try as the hosts, roared on by a 10,000-strong crowd, pressed hard for their first win against Samoa in four attempts. 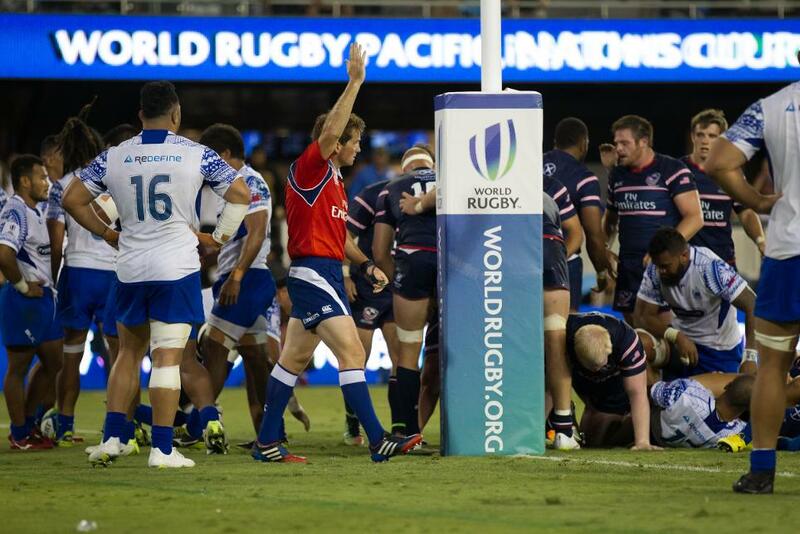 Despite falling just short, the USA can take plenty of positives going into their RWC 2015 meeting with Samoa in Brighton on 20 September. "We just had a week together but in the second half we showed each other we can fight," said Eagles captain Chris Wyles. "It was disappointing, though, because I thought we'd be in it for the win." Showing no signs of fatigue from their long-haul flight, Samoa dominated possession and put together multiple phases together to stretch the USA defence in the early exchanges, and by the 23rd minute they were 9-3 up thanks to three penalties from Fa'apale to one in reply from MacGinty. Samoa crossed the Eagles’ line in the 32nd minute when full-back Tuala returned a clearance kick with interest and offloaded for Tuilagi to score his first international try for over two years. Fa'apale converted. Tuilagi returned the favour five minutes later when, following a quickly taken penalty, he kicked the ball to the far corner and Tuala swooped to score. The introduction of experienced forward Scott LaValla shortly after the re-start helped to galvanise USA and the Eagles reduced the deficit when Irish-born playmaker MacGinty kicked his second penalty of the match in the 54th minute. A late tackle from Tuilagi on another former Leicester Tigers player Blaine Scully earned USA another opportunity and MacGinty made no mistake from the kicking tee. A series of pick and go’s then culminated in Lamositele, a first-half replacement for Matekitonga Moeakiola, reaching out for the line and touching down for the Eagles’ only try. MacGinty converted to set up a grandstand finish. USA kept pounding away at the line in the final five minutes but to no avail, as Samoa held on to claim a hard-fought win. “Bringing any team together, it takes a rhythm to develop that attack. The second half they felt more comfortable, they dominated territory, and they dominated possession. We just have to not give up 21 points at the beginning of the game,” said head coach Mike Tolkin. USA take on another RWC 2015 opponent in Friday's second round of fixtures when they play Japan at Bonney Field in Sacramento, while Samoa are up against Fiji, who kicked off their campaign with a 30-22 win over Tonga, at the same venue earlier in the day. 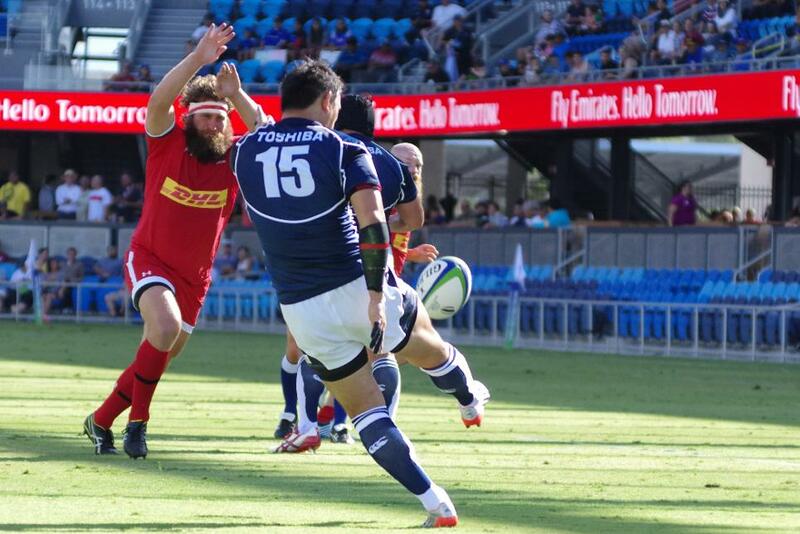 Japan's all-time record points scorer Ayumu Goromaru kicked 15 points and Yoshikazu Fujita scored the only try of the game as the Brave Blossoms extended their unbeaten run against Canada to seven matches with a 20-6 win in the first match of the day at the Avaya Stadium in San Jose. Canada’s points came from the boot of Gordon McRorie who kicked two penalties, one in each half. Canada were heavily penalised by English referee Luke Pearce, and captain Tyler Ardron says discipline is something they will be working hard on during the week leading up to Friday’s game against Tonga in Burnaby. Goromaru (pictured) kicked Japan ahead after only eight minutes and the lead increased to 8-0 five minutes later when Kotaro Matsushima darted through the Canadian line and offloaded to Fujita who cruised in for his 25th test try. Canada responded brilliantly, however, as McRorie converted his first penalty of the game after Hitoshi Ono was penalised. Goromaru extended the Japanese lead in the 29th minute to 11-3 with his second penalty of the night. A few minutes later, Japan were reduced to 14 men as Yu Tamara was sent to the sin bin for a tip tackle on Connor Braid. Despite the man advantage, Canada were unable to put points on the board and trailed 11-3 at the break after Goromaru missed a penalty in the 39th minute. However, he would make up for it in the 44th minute as Canada were penalised for not using the ball at the back of the scrum and less than 10 minutes later, the lead was 17-3. Once again Canada responded well as first Braid smashed through the Japanese line but his offload found the hands of Michael Broadhurst which ultimately led to a penalty, which McRorie converted in the 61st minute. Goromaru added his fifth and final penalty in the 67th minute to make it 20-6 and Canada spent the final 10 minutes of the game camped in the Japanese half but couldn’t find a way past the resilient Brave Blossoms' defence.